Get a visual overview of upcoming tasks and the utilization of resources. InLoox PM 8 provides you with different features to adjust the Gantt chart in a quick and comfortable way. If you have no reading permissions, you cannot see planning elements in the Gantt Chart. Edit a planning element directly in the planning list You can change the name and the time frame of the element directly in the planning. Click on the planning element row that you want to change and enter the new values. Change the position and duration of planning elements Press CTRG and drag the predecessor / successor relationship between activities and milestones with the mouse. Define the duration and work load of the work package Use the Work duration and Workload fields in the planning list. The Work duration field displays the planned duration. It can be set by project planer. The Workload field displays the actual duration of the work package. A resource can edit it. The project planer can be informed about actual duration. Then he adjust the distribution of the resources. For more information on how to use the fields, see Work with the planning, in the Features on the View tab. Move or extend planning elements Keep the SHIFT key on your keyboard pressed and drag the planning element in the required position. So, the successor and predecessor will not be influenced by the changes. Center the selected planning elements Click on the selected element in the Gantt chart. Zoom in and out the view Press CTRG and scroll the mouse wheel for zooming. Edit dependency Double-click on the link line in the Gantt chart. The Edit Dependency dialog box is displayed, where you can change the type of dependency and the lag. 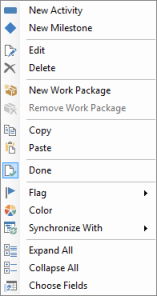 The context menu provides you with almost all basic features that are also on the Planning page, such as New Activity, New Milestone, New Workpackage or Remove Workpackage, Edit, Delete, Done, Flag, Synchronize with. It has also such features as Expand and Collapse All, Choose Fields, Copy and Paste. Right-click in the Gantt chart to open the context menu. For the detailed description of these features, see Work with the planning. The current time is represented by a vertical yellow line. The project end is marked in red. For more information on how to activate the command Fixed deadline on the Management page in order to see the project end in the planning, see Add other project information. A time period is then in red in the planning, if the planning elements are over the project end in the planning. A blue bar shows the status of the activity in percent (%). For more information on how to set the status, see Create and edit an activity or Create and edit a milestone. Working times within start and end dates of the project are colored with a white background. Non-working times are colored in grey. If you add a work package to the planning, you will see its workload in the Gantt chart. InLoox PM allows you to start your planning earlier than the project start and to finish it later than the project end. In both cases, the planning for this time period is colored in red. CTRG+N Create a new activity. CTRG+N Create a new milestone. CTRG+A Select all planning elements. CTRG+C Copy a planning element into the clipboard. CTRG+V Paste a planning element from the clipboard to the Gantt chart. CTRG+arrow to right Moves the selected element to right. CTRG+arrow to left Moves the selected element to left. CTRG+arrow upwards Moves the selected element upwards. CTRG+arrow downwards Moves the selected element downwards. Mark the last element in the project plan+arrow downwards Creates new planning element. Insert Inserts new planning element. A check mark shows that the element is marked as completed. An alert shows that the element is already overdue and has not been completed yet. A flag is used to highlight specific elements. The symbol resource shows that resources have been assigned to the element. The symbol resources have finished work shows that all resources assigned to the element have completed their tasks. A paper clip shows elements to which documents are linked. The calendar symbol if constraints have been set for the respective planning element. For more information, see Create planning elements. InLoox PM communicates a conflict with this symbol, if a predecessor will be moved. An einem Planungselement darf nur ein Nutzer arbeiten, für alle anderen ist dieses Element gesperrt und ist durch ein Schlosssymbol gekennzeichnet. Working with the Gantt chart planner | InLoox PM 8 • Copyright 1999-2019 © InLoox GmbH. Tous droits réservés.